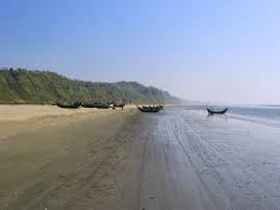 The Real Estate and Housing Association of Bangladesh (REHAB) is moving ahead with a big plan to build an attractive satellite town close to the world’s longest beach Cox’s Bazar on approximately 1,000 bighas of land. The plan, according to REHAB leaders, has been chalked out to attract increased volume of tourists, both from home and abroad, with modern and safe recreational facilities for them. “We’ve already placed a proposal to the government to allocate land for us. We want to build a modern and well-planned recreational zone in Cox’s Bazar,” REHAB acting general secretary M Saidul Islam Badal told UNB on Thursday. If the government allocates the required land and the project is implemented accordingly, he said, it will help give a big boost to the country’s economy through enhancing national resources and foreign currency earnings. According to the plan, REHAB will monitor and prepare the architectural design of the zone on which REHAB members will build modern recreational centres based on land distribution. The REHAB leaders think that such initiatives will help stop siphoning off money abroad from the country. REHAB, which has now nearly 1200 members, is also planning to arrange fairs aboard to attract foreign investments for the project. Housing and Public Works Minister Engineer Mosharraf Hossain on Thursday assured the REHAB leaders of forming ‘One Window Cell’ to remove the barriers faced by the housing sector, especially minimising the lengthy process in approving building designs. The assurance came at a meeting between the Minister and the REHAB leaders held at his Secretariat office. Acting President of REHAB executive committee Maj Gen (retd) M Abdur Rashid led the REHAB delegation. REHAB Vice President Liyakat Ali Bhuiyan, acting general secretary M Saidul Islam Badal and Rajuk Chairman Engineer M Nurul Huda were also present, said a REHAB media release. The REHAB leaders placed a five-point demand and urged the minister to resolve the housing sector’s problem.